Some may consider dressy flip flops to be an oxymoron, but that's not true! Flip flops can be dressy. So toss aside those notions that all flip flops are beach and poolside wear only. Dressy styles are a great way to stay cool when it's hot outside and keep up with the trends. Unfortunately for men, it's much easier to consider certain styles of women's flip flops as dressy while theirs remain almost exclusively in the "casual" territory. You can purchase your shoes just the way you want them or enhance them yourself. Those with small heels will appear dressier than flats. Though dressy sandals can make their way fabulously into almost any occasion, still be sure to check the dress code (if there is one) before wearing open-toe shoes. So with all of the extras, what makes these flip flops different from all of the other dressy sandals? It is the strip of material that fits between the big toe and the others coupled with the fact that they are completely backless. Dressy flip flops are perfect for most spring and summer days. If you're hoping to wear them to work and you have a relatively casual dress code, you may be able to wear this type of flip flops (but always leave the stained, printed beach flip flops at home!). Check your handbook to be sure. However, for dates, barbecues, picnics, parties during the day or night, weddings, and more, you can let your feet breathe easy in flip flops that are dressed up and a little on the fancy side. Just make sure you either have a pedicure or you give yourself one so that the whole image is a classy, pulled-together look. Scrub those heels and paint your nails. They go well with everything from your favorite pair of shorts to your blue jeans. Pair them with skorts and sundresses, too. Aside from your most casual, worn-out apparel, there is not much that you can't pair these with. Flip flops are some of the most versatile shoes around, and making them dressy just enhances their appeal and lends them to that many more outfits. 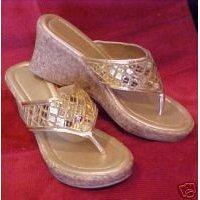 You can get fancy flip flops suitable for those warm weather events almost anywhere dressy shoes are sold. You will probably only be able to find them in the spring and summer months; you might also be able to find them in the months leading up to spring, too. If you're looking for something relatively simple that you haven't been able to find in the store, you may be able to make your own. Craft stores have blank slate flip flops you can add rhinestones and flowers to--or anything else you'd like to use to dress them up. If you want a different style than those offered in the craft stores, you can choose a simple pair of flip flops in the style you'd like (kitten heels or wedges, for example) from any shoe store and then make them your own, just as you'd like them for that perfect outfit or special event. This type of flip flop will fit in almost anywhere, with almost any type of outfit. As long as you are allowed to wear open-toe styles, feel free to flaunt your new pedicure.